Of the many veins of horror and dark fiction due to be be reopened this Halloween (veins that, for many fans, stay open all year long), one of the genre’s more unique settings is the circus sideshow. Beyond just a fear of clowns (present in everything from The Dark Knight to It), the otherworldiness of the sideshow contains within it various intersections between body horror, cryptozoology, abnormal psychology, and the occult. Ask a longtime horror fan where the roots of this subgenre were formed in literature and film, and responses will likely include Tod Browning’s 1932 film Freaks, as well as Ray Bradbury’s pair of 1950’s carnival-themed novels, The Illustrated Man and Something Wicked This Way Comes. And while Freaks is arguably the earliest (and strangest, and most experimental) depiction of the sideshow ever recorded on film, this more sinister side of the 20th century fairway was first explored on the page not by Bradbury, but by Charles G. Finney, in his lesser-known 1935 novella The Circus of Dr. Lao. As with Freaks, …Dr. Lao is a work that was in many ways far ahead of its time. Its plot is no more structured than a circus itself: the story begins as a bizarre traveling show populated with mythical beasts (among them a sphinx, a medusa, and a murderous sea serpent) arrives in a small town in Arizona. The book’s middle third unfolds as the townspeople explore (and in some cases, meet their demise) within the sideshows, and the third act takes place under the big top, as gods and devils are summoned, and subsequently seem to lay the entire circus (and town) to waste. The story has few recurring characters save Dr. Lao himself: an enigma whose behavior and manner of speech changes in accordance with whomever he’s dealing with. The cast of creatures and circusgoers around him is so big that the book includes extensive endnotes to keep them all straight, but these notes (as with the story that precedes them) are often sardonically tongue-in-cheek: “A sad memory,” reads the description of one character who meets an unfortunate end under the gaze of the medusa. “Cretins,” reads another, describing a group of children who attend the fair. Closer to Carnivàle than American Horror Story, The Circus of Dr. Lao is can be comfortably classified as dark fantasy rather than standard horror. But it’s also an unforgiving social satire, critiquing xenophobia, anti-intellectualism, and organized religion in equal measure. Those who attend Dr. Lao’s circus seem as equally unconcerned with the majesty of the creatures they find as they are with surviving the circus at all. Dr. Lao, on the other hand, is both disgusted by their indifference, and resigned to an existence in which he alone appreciates the arcane wonders his show provides. 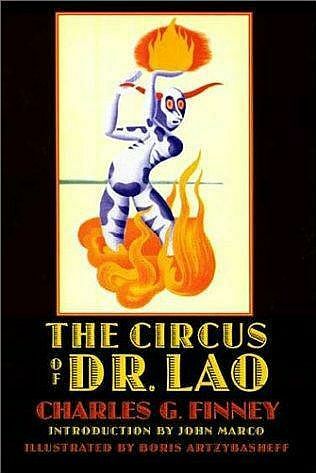 The Circus of Dr. Lao is widely available in paperback from various publishers, often accompanied with phantasmagoric drawings by original artist Boris Artzybasheff. It’s a lost classic that’s well worth seeking out for readers looking to wander off the beaten path this Halloween. When a circus caravan is torn apart by a destructive summer storm, the show’s tattooed man and his fellow performers are scattered across the wheat fields of a nameless hamlet. The tempest’s survivors convene at a local boarding house, but a series of violent attacks and strange deaths sabotage their attempts to regroup. The show’s tattooed man is Sue, a middle-aged, world-weary war veteran whose days are haunted by dark memories. At night his inks call to him, seemingly alive. As the circus strains to stay the course, Sue’s sense of reality begins to fragment — and something reaches for him from the recesses of his past.